Thriller - Live is a spectacular, high octane show celebrating the career of the world’s undisputed King of Pop – Michael Jackson, and the Jackson 5. 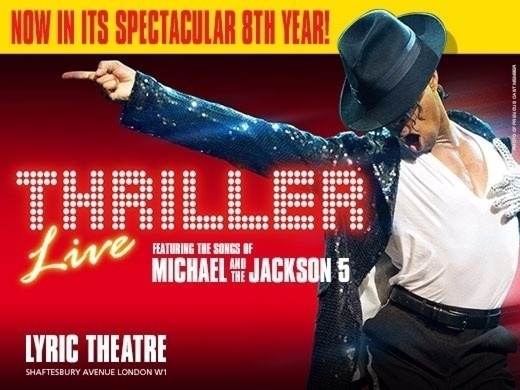 To bring to life on stage the sensational dancing and distinctive sound of the Jackson’s greatest hits, Thriller - Live includes eye-popping multi-media effects and dazzling choreography by the shows award-winning director Gary Lloyd, plus additional choreography by 5 time MTV award-winning LaVelle Smith Jnr. In a career spanning 40 years, Michael Jackson has sold an unparalleled 750 million records worldwide with the Thriller album still the world’s best-selling recording of all time. Thriller - Live includes over two-hours of non-stop hit songs in a show that boasts the world-class spectacle that marked their legendary live performances. Expect your favourite Jackson songs delivered by an exceptionally talented cast and live band, including the smash hits: I Want You Back, I’ll Be There, Show You The Way To Go, Can You Feel It, Rock With You, She’s Out Of My Life, Beat It, Billie Jean, Earth Song and Thriller plus many more! I took my wife to the western for the first time for her 60th birthday. We saw thriller at the lyric on the 16/2. The show itself was good, my wife enjoyed the music and dancing however the lyric itself was not to put too fine a point on it, a disgrace. I have not been in a theatre where the seating is so cramped since the sixties. We were in the dress circle and the temp must have been hitting 90 degrees especially in the second half, people were taking coats jumpers and unbuttoning shirts it was so hot, why no air conditioning? It was so uncomfortable it took a lot of the enjoyment away. Really at the prices that are being charged I expect more, this wasn't the western I have read so much about. Certainly won't be recommending it to anyone.